After careful review and discussion, MANA, CHCA and Good Growth DeKalb submitted this joint statement to the Medline LCI study group. To review all our posts on the Medline LCI, click here. For the Medline LCI website, click here. Many of us went to the presentation of the Medline plan a few weeks ago. It was great to see a long-term plan for our area – good work by all involved. Representatives from the Clairmont Heights Civic Association (CHCA), Medlock Area Neighborhood Association (MANA) and Good Growth DeKalb have reviewed the Medline LCI draft plan individually and met to discuss it. While we are very supportive of the process and the results, we have serious concerns about the proposed zoning overlay proposed on pages 102 and 103 of the report. We also have several questions about the transportation overlay. Theresa Same (Zoning Chair for MANA) has already contacted you about our desire to schedule a meeting to include the Medline LCI team as well as our Commissioners. Our primary concerns are in the areas of Zoning and Transportation and are outlined below. Our residential areas require appropriate, generous setbacks and clearly defined medium density. Under zoning, while the report states that: "An overlay district is recommended for the Medline study area to encourage high density mixed use development in the center of the study area, with medium density residential development on the periphery, as a transitional buffer into the surrounding single family neighborhoods. (p 102)" the actual zoning overlay map on page 103 shows high density in the majority of the study area, often with no medium density between it and R-75 properties. The proposal also fails to include any recommended setbacks from residential property. Clearly defined medium density is appropriate for the area; high density “up to 14 floor” developments are not healthy for established residential neighborhoods and set a worrisome precedent for homeowners within and beyond the Medline LCI. Since high density is defined as "15-30 units/acre allowing up to 14 floors" per the marked-up map below, this means, for example, that our neighbors on McCurdy could have 14 story buildings in their backyard and they would have no grounds on which to oppose it. This is also true for all the cul-de-sacs coming off the east side of Woodridge, some of Woodridge, Blackmon Drive, some of Medlock Road, Eastway, Sunstede (as the Woodshed and Melton's lots are also zoned for high density). This is also true of the streets in Springdale Heights, Decatur Heights and others. 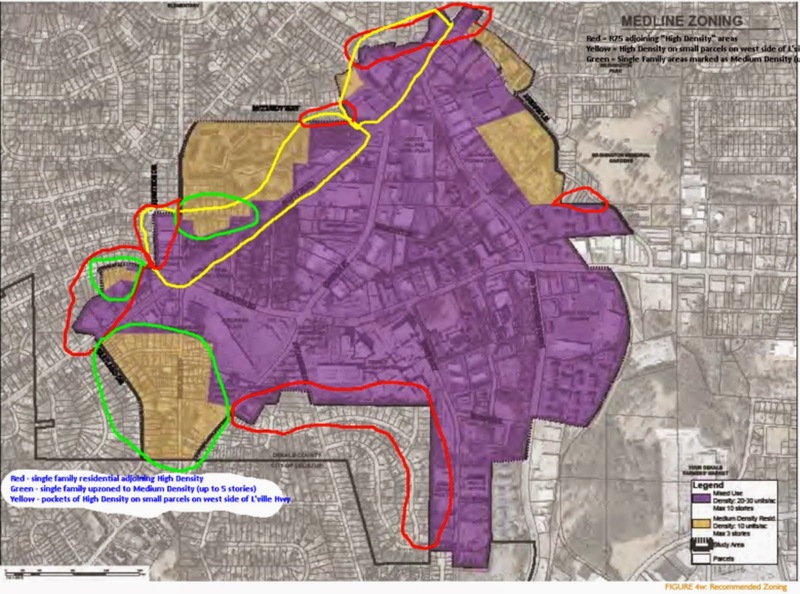 We believe that all the areas mentioned above as well as the areas highlighted on the map below should have "medium density residential development as a transitional buffer into the surrounding single family neighborhoods." Medium density is not defined in your report, though scale on the map defines it as "medium density, 10 units/acre with maximum of 3 stories." Since medium density is often defined as up to 5 stories, we want the report to clearly define medium density as 3 stories, not 5 stories. We would also like to see a line that specifically states that no existing single-family zoned parcels should be designated as medium or high density if there are two or more contiguous parcels. For the affected areas in MANA and CHCA’s boundaries, we feel that the non-single-family study areas on the west side of Scott Blvd and on the north side of N. Decatur Road should be zoned "medium density." This seems like a natural progression of density levels - single family (R-75) inside the neighborhood, step to medium density non-residential on the edge of the neighborhood and high density on the other side of Scott Blvd toward the center of the study area. 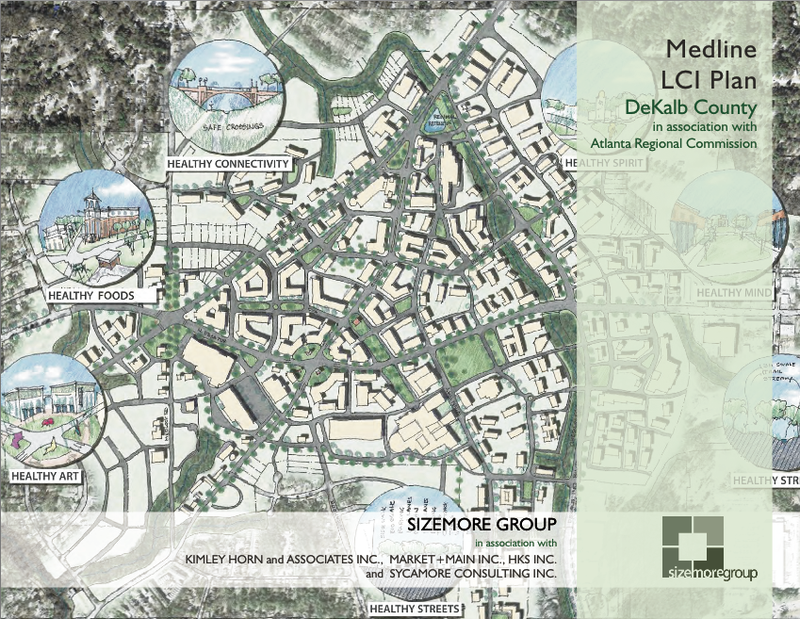 Medline LCI recommendations, the zoning overlay plan and DeKalb Zoning Ordinance must be consistent with each other. This is an important piece of the puzzle to modify in the draft as the zoning overlay will be the quickest and most concrete change that will be made as a result of the LCI study. We anticipate that developers will maximize whatever zoning they are given, and therefore must take a strong stand today and require the overlay map to match the recommendations of the report. Additionally, as DeKalb is in the final stages of their rewrite of the DeKalb County Zoning Ordinance, we would like to see references to specific sections of the updated code if the plan is for the ordinance to be the basis for zoning details to be implemented under the overlay. The Transportation Overlay is much harder to address since there are so many stakeholders. From what we understand, by comparing page 109 (conceptual Transportation Connectivity Map) and page 103 (short-term implementation map) there are 4 new roads + 2 existing roads from Scott Blvd into the neighborhood within the study area as well as two possible new signalized intersections. 5. Larry Lane (existing) appears to have the other signal as the proposal discusses making Church Street a "T intersection". On page 109 it looks like that intersection lines up with Larry Lane, but that would not make it a T.
6. New road between Vol Repairs and the power lines. We don't know how realistic it is to make any of the new roads happen or what the timeline is but what concerns us about the plan is that all these roads lead to Medlock Road and then offer nowhere for the traffic to go. This plan simply relieves North Decatur Road traffic by engineering more cut-through traffic for MANA and CHCA and does not address the root of the problem. These transportation recommendations must looked at in the larger context of the Clifton Corridor: a systemic problem that cannot be addressed in a piecemeal fashion. Thank you for your hard work and for a great start on a new plan for our area. We look forward to working with you to generate a final document that all participants can be proud of and that will serve our communities through the many transitions that we can expect in the coming years.